A photo booth & a post box for just £145 for all weekend hire. 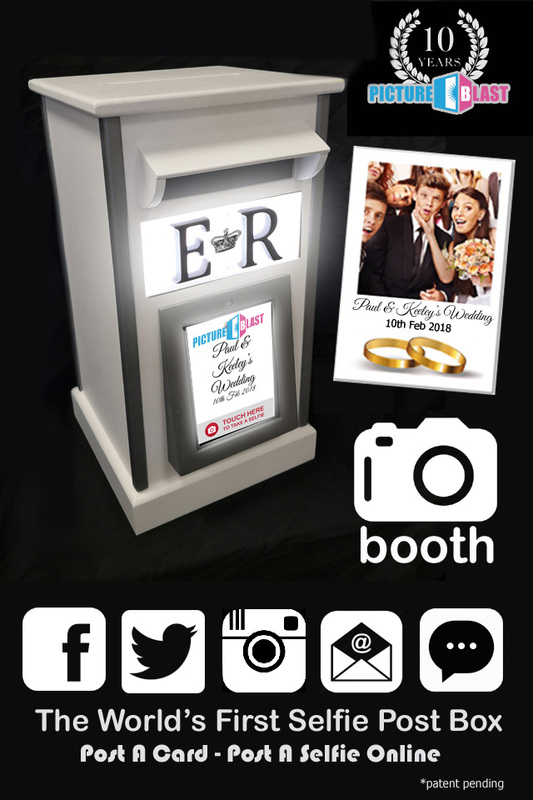 The latest “must have”, combining a photo booth with a traditional post box for your wedding cards and now with the option of a guest book made up of your 50 best photos and sent to you after the hire! Our Selfie Post Box’s are delivered to your doorstep and includes everything you need, it’s quick, easy, and fun! You got the Selfie Letter box for the whole weekend , so not only can use the photo booth on your wedding day, but also capture the lead up by using it the night before and the morning after! (you can move it around your venue too to maximise the usage). The photo booth can be used at all times not just when posting cards so it will capture your day guests and also provide entertainment for your evening guest too. Your guests use the photo booth and once the image is displayed (branded with your names and date) they can choose to upload it to facebook, twitter, instgram, iMessage and email (all or any of these can be disabled is desired). We send you all the digital images the photo booth has captured..
We send you the post box via courier before your event and collect after (all included in the price), you simply turn it on and place on a table for your guests to use. It also comes with a secure combination lock on the rear door to keep your cards safe. We pre configure the selfie post box with your names and date on the welcome screen and the images before sending it out to you and we arrange collection with you for after your wedding – all prepaid and part of the service.